Join us for a new program at the Chicago Botanic Garden on Saturday, May 9: World Bonsai Day! Observed on the second Saturday in May, this day was established by the World Bonsai Friendship Federation (WBFF) in 2010 to honor WBFF founder and bonsai master Saburo Kato’s contributions to the world of bonsai, and to bring all bonsai enthusiasts together for a day to promote bonsai and friendship throughout the world. The oldest son of bonsai master Tomekichi Kato, Saburo Kato followed in his father’s footsteps cultivating bonsai, and at his father’s death, became the third-generation owner of Mansei-en Bonsai Garden in Japan, one of the most famous bonsai nurseries in the world. As an author, teacher, and poet, Kato inspired countless people throughout the world to learn the art of bonsai cultivation. He believed so strongly that bonsai could bring peace throughout the world that he founded the WBFF. In 2014, the following organizations celebrated World Bonsai Day: National Bonsai & Penjing Museum (at the United States National Arboretum), the North Carolina Arboretum, the Morikami Museum and Japanese Gardens, the Pacific Bonsai Museum, and Rosade Bonsai Studio. 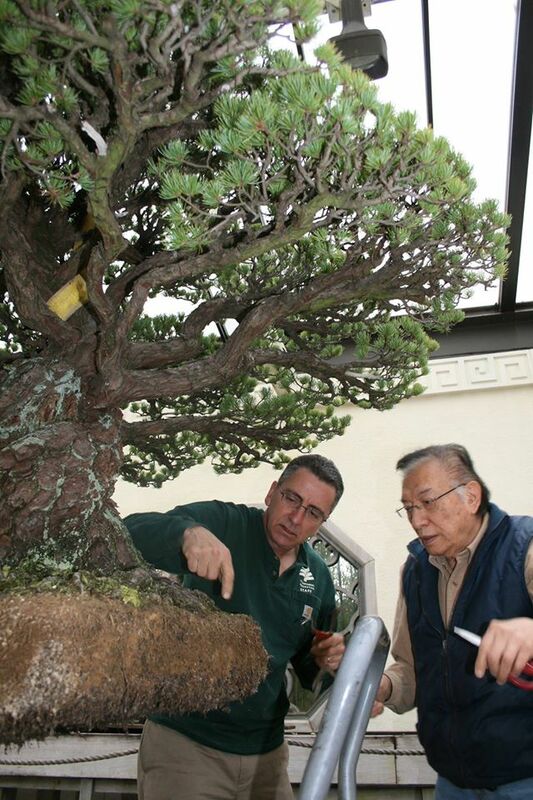 Curator Chris Baker of the Chicago Botanic Garden trims a bonsai, under the watchful eyes of Jack Sustic (far left) and bonsai master Harry Hirao (seated). Join me, curator Chris Baker, and some of our bonsai volunteers in the activities below on World Bonsai Day at the Chicago Botanic Garden. The stages of growing bonsai will be featured with specific examples. Explore the tools, pots, wire, etc., used to practice bonsai, and get information on upcoming bonsai classes. 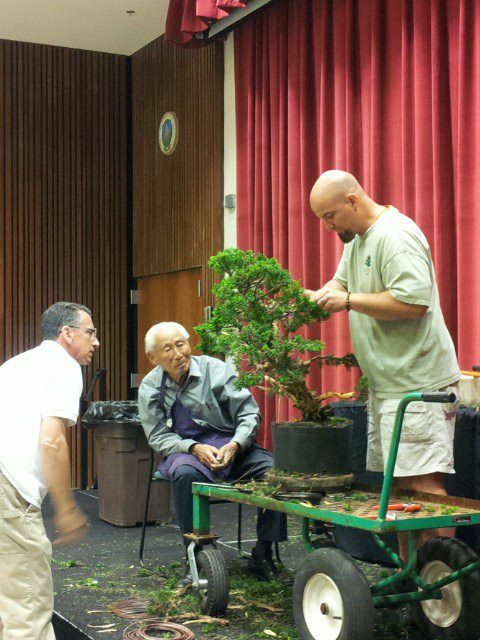 I will demonstrate how major tree shaping is done, with a tree being formed into a bonsai. I will demonstrate how I create a “landscape planting” with multiple bonsai on a rock slab. Come back to the Garden May 16 – 17 for the Midwest Bonsai Society Spring Show & Sale.